Taking Marketing Seriously | Golden Orb Ltd DC Innovator Award winner! A while back, we wrote a plea to businesses to start taking a more professional attitude towards their marketing (It’s time to take marketing seriously). In that post we argued that it is time to treat marketing as being as much a science as an art, with more rigorous targets, measurement and greater accountability to the business. The quid pro quo for this, though, must be to provide the Marketing department with the tools and data they need to do their job properly. In many organisations, marketers have a wide range of commercial responsibilities in addition to their core role of attracting and retaining customers. They provide key inputs to the sales forecasts which underpin the financial projections of the business, they may have margin or contribution targets rather than pure revenue, and they are frequently called upon to create a wide range of reports and analytics for senior management. Sadly, in all but the most sophisticated businesses, much of this work is still done in Excel – that old standby that so often fills the gaps between existing systems. We have spoken in the past on the perils of relying too heavily on Excel as a core part of the business process (business risk, level of detail, ease of sharing and integrating etc.) and do not propose to revisit that theme now. The purpose of today’s post is to examine in a bit more detail what we mean by taking marketing seriously. What are the core principles, and what should be done to address them? I should add that this post is primarily relevant to short-term marketing activities that have a fairly immediate impact on sales. This post does not address longer term brand-building investment like TV advertisement, although it is relevant to direct response TV. The key message is for businesses to take real control of their marketing. Be pro-active in deciding what you are going to do and why, ensure you keep an eye on it as it happens, and evaluate it for effectiveness afterwards. With tools like online ads, marketing automation and affiliates, it is all too easy to let a significant part of your marketing activity ‘just happen’ without any degree of control. The most important thing is to have a plan, even if you know that it will have to change during the course of the year. The simple act of making a plan forces you to think about your marketing, what your approximate budget should be and roughly how it should be allocated between different activities. This in itself encourages organisations to stop and think about where they can get the most bang for their buck. It does not need to be too detailed or restrictive, but making a change should provide an impetus to reflect on the reason, which should help to ensure the change can be justified, and also should improve planning next time round. A small startup may well adopt a scatter-gun approach to marketing – trying all sorts of different approaches to see what works. However, once an organisation is more established, they should have an idea of what works and what does not, and be able to make a reasonable estimate of what sort of a response they are expecting. Even where those estimates are subject to a wide variation, it is important to have some idea of what impact you are looking for, against which to evaluate the proposed expenditure. With an estimate of the overall response to a planned activity and a profile of how those orders will come in over time, it is possible to derive a detailed sales forecast directly from the marketing plan. Done well, it will be responsive, such that a change to the plan automatically updates the sales forecast. Furthermore, with an estimate of average order value and cost (or product mix), it is possible to translate that sales forecast into revenue and margin, and by incorporating the marketing and fulfilment costs, to plan right down to the level of contribution. Product and resource requirements can be incorporated too, as can forecasts of recurring revenues. This sounds trivial, but in many organisations, much more effort goes into setting up activities than actually monitoring or evaluating them. Marketers are so focused on writing the next e-mail, or designing the next mailshot that they do not have the time to keep an eye on what is currently running. This is particularly the case if systems are not in place to make it easy. It is important to keep an eye on how marketing activities are progressing, if only to check that the money is being spent as expected and is generating the required results. If the organisation has built a sales forecast that is driven by the marketing plan, it becomes possible to update the forecast dynamically as the results come in, giving the business time to respond. If a campaign appears not to be working well, it might be possible to amend or abort it, or at least, avoid making the same mistake again. This is, of course, a critical part of taking marketing seriously. Many businesses will evaluate major marketing initiatives to see how well they worked, but if this evaluation is a manual affair, involving copying various bits of data into a spreadsheet, then it will be time-consuming and the learnings short-lived and primarily of benefit to the individuals involved. What is needed is a structured, automated approach to evaluating all marketing activities, feeding into a knowledge base available to all. If all activities are evaluated on the same basis, then there is no systematic bias to the big ticket campaigns, or to one type of activity over another. If the process is automated then there is a considerable time saving over any manual approach, and if the results are all captured in a database then the learning is available for the organisation for years to come. With the correct tools, historic campaign results can be mined time and time again to see what lessons can be learned. The systems requirements to support this enlarged role are quite broad, as they need to cover planning capabilities and reporting of actuals, with the ability to integrate the two. Whilst ERP systems might handle elements of the planning and reporting aspects, and sales reporting systems might some reporting and evaluation, we have not found anything on the market covering the full range, including the ability to update forecasts based on partial actuals. We have therefore developed and launched our own Compas marketing management system, which is available on a SaaS basis. Based on software originally developed for various large marketing-led multinationals, it makes sophisticated marketing planning and analysis available for a single monthly fee to much smaller organisations who feel they have outgrown Excel. 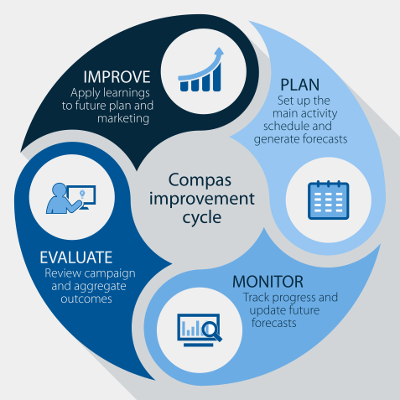 Click here to arrange a demo, or to discuss how Compas could help streamline your marketing.